If you'd like to make a MILLION DOLLARS in the next twelve months, a winning strategy is definitely important. But, there's something else that may be even more important… Do you know what it is? It's important for you to know that Chuck Hughes trading strategies have been incredibly profitable every single year. During the 2000-2002 "tech wreck", when the S & P plummeted from 1500 to 800, Chuck Hughes made $1.244 Million. In 2002-2003, when erratic price swings had most investors sitting on the sidelines, and others being whipsawed out of their last dollar, Chuck made $635,451.25. And in 2008, during the worst financial crisis since the great depression, Chuck made $473,311.04! Chuck Hughes, and his winning strategies for stocks and options have made him a millionaire many times over-- and they've given him a very rewarding life. Chuck Hughes recently made a staggering $1.023 Million in just 26 days. Up until now, you've been denied your full potential for success. But that's about to change… the minute you join the Wealth Creation Alliance. Become a member of the we alth creation alliance. 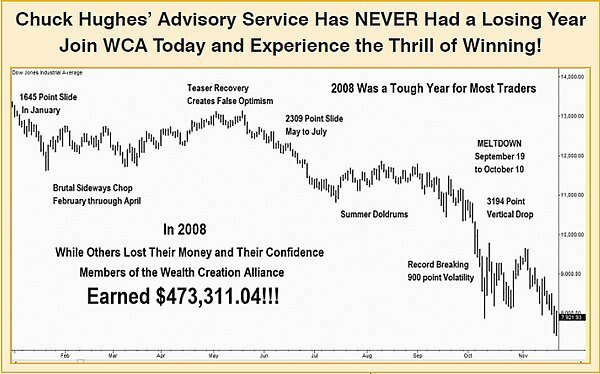 The Wealth Creation Alliance is a visionary program unlike anything you've ever seen before. It is the pinnacle of Chuck Hughes life's work. And for Chuck to succeed, YOU must succeed. So, Chuck Hughes has gone to extraordinary lengths to help ensure that you enjoy the thrill of success along with other WCA members. Wealth Creation Alliance Trading Strategy: Members receive access to an exclusive trading strategy that provides specific trading recommendations for the Wealth Creation Alliance trading strategies.These trade signals identify profit opportunities that members can take advantage of immediately. Support is provided by our experienced staff so that every member understands and can implement the trade recommendations. 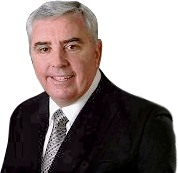 Wealth Creation Alliance Members: Only Guide to Abundant Wealth Under Any Market Conditions: the greatest treasure trove of wealth-creating secrets ever assembled. Members-Only Online Trading Toolbox: exclusive access to the very same calculators.